Cambridge City, Indiana, founded in 1836, is located in Jackson Township on the western edge of Wayne County. Children in this community attend Western Wayne Schools..
A historic "Pike town", the National Road was a driving force in the economics of building this community. Additional transportation options came and went through the years, leaving their mark on the town. 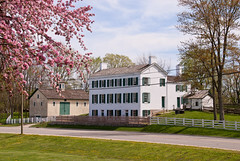 Travelers on the Whitewater Canal would often stay over at the Vinton House, since the canal came right to it's doors. The remnants of a multiple railroad lines can be seen in the arched viaducts on the south side of town. In the early 20th century, residents were able to hop aboard the Interurban line to travel via to Richmond or Indianapolis. The whole town pitches in to create the fun for Canal Days on the first full weekend in September each year. Organized by the Cambridge City Area Chamber of Commerce, Canal Days includes a car show, performances, vendors, and of course, food! 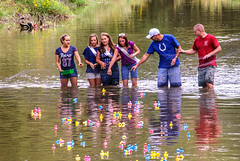 The highlight of the weekend is a parade on Sunday, followed by a rubber duck race on the river in Creitz Park. 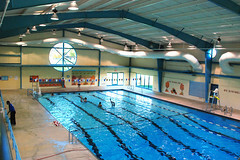 View more images of Cambridge City, Indiana.